I like to convince myself that the Matt Salinger Captain America movie never even happened. So for me, this was my first time seeing the star spangled avenger come to life in a live action motion picture. Marvel Studios and Paramount have collaborated on several movies now and each entry in their catalogue has been continuously impressive. 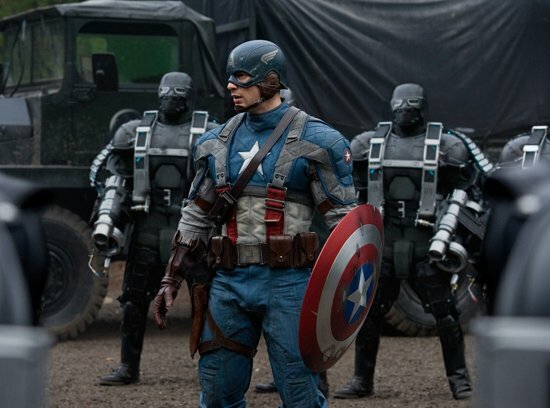 Captain America: The First Avenger is inexorably linked to the The Avengers movie next year. The Incredible Hulk, Iron Man [1&2] and Thor all worked pretty flawlessly as movies but should Captain America fail, it could endanger what is going to be one of the most incredible cinematic events in history as these heroes finally come together to battle evil in the one movie. Captain America: The First Avenger serves a dual purpose both as an introduction to the character who will lead The Avengers super-hero team and also brings the final pieces of the grand mystery that has been glimpsed in post-credits stingers for more than 3 years now. Like the other movies in the franchised, Captain America stands firmly on it’s own two feet and never reduces itself to being simply the piece of a larger whole. When I saw Chris Evans was picked to portray Steve Rogers I was unsure. His performance in the Fantastic Four series was hardly stellar, but to be honest, he didn’t have a lot to work with those movies. Come to think of them in fact I believe Evans now puts a nail in the coffin of that franchise which isn’t exactly bringing a tear to my eye. Then I saw him in the even-more-awful Scott Pilgrim vs. The World as Lucas Lee and changed my mind – he’d certainly work as Cap and I was right. His performance as a weedy but ambitiously patriotic young Rogers is flawless but he really comes into his own when dosed with the Super Soldier Serum so he can become a living weapon, the first in an army of super-soldiers with which the U.S. can better combat the Nazi menace sweeping across Europe. 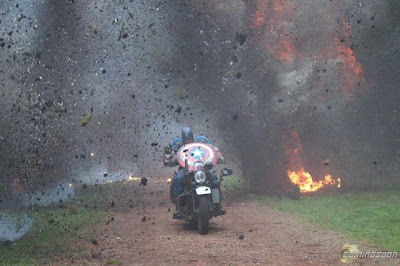 That's right, while the tale is framed by present day scenes, the majority of the movie takes place during WWII just as a Captain America origin tale should [the character first appeared in 1941]. While a comic book delivers it's story through illustrations with speech bubbles, it's up to a solid array of actors to make those drawings flesh and voice, and The First Avenger's cast is stellar. 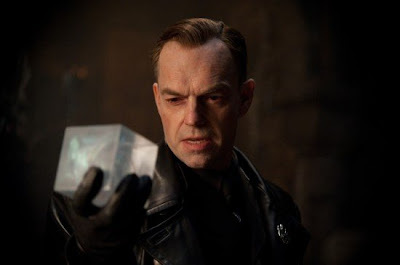 Hugo The Matrix Weaving was a deliciously OTT Johann Schmidt AKA Red Skull and single-minded in his quest for the Cosmic Cube, witnessed in the stinger at the end of Thor. I’m wondering however which of Weaving or Mark Strong gets the call “I want you to be the villain in my next movie” first nowadays as they seem to have cornered that market in recent years. Kings actor Sebastian Stan gets to be Captain America’s buddy Bucky Barnes, Tommy Lee Jones is excellent as Col. Chester Phillips. Hayley The Pillars of the Earth Atwell is Strategic Scientific Reserve officer Peggy Carter, Stanley The Core Tucci is Dr. Abraham Erskine, creator the Super Soldier Serum, British theatrical actor Dominic Cooper as Howard Stark – Tony’s father and not forgetting Neil Star Trek: First Contact McDonagh as "Dum-Dum" Dugan of The Howling Commandos. Director Joe The Rocketeer Johnston is know for his effects-laden movies and he doesn't disappoint with the cinematic spectacle he delivers here. Among the 1600 effects shots were a multitude of scenes with Steve Rogers before he was "bulked up" by the Super Soldier Serum using complex green screen and body double technology. 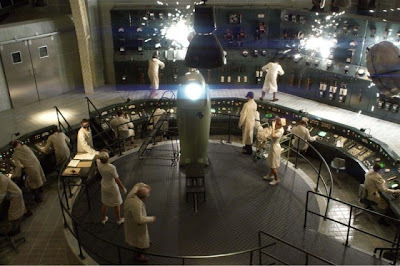 There was one or two hokey effects shots [one scene where Cap was running after a bomber inside a massive hangar was especially crud] but they weren’t enough to snap you away from your immersion in this incredible stylised wartime world that Johnston and his team created for us. Veteran composer Alan Back To The Future Silvestri composed an instantly classic score, evoking the great epic cinematic qualities of old WWII adventures. I'm pleased to announce that there is nothing to worry about, the world has accepted The First Avenger as a hero to admire [he did surprising well overseas for someone with “America” in his name and literally dressed in an American flag suit and has made over $350m]. The hype for The Avengers is already assured some measure of success provided Joss Serenity Whedon doesn’t screw it up, but the Marvel Super-Hero train is going so fast now, I doubt even he could derail it. Final Verdict: An old-fashined adventure tale, another outstanding work of Marvel cinematic gold and another kick in the teeth for DC/Warner's epic fails at everything except Batman.